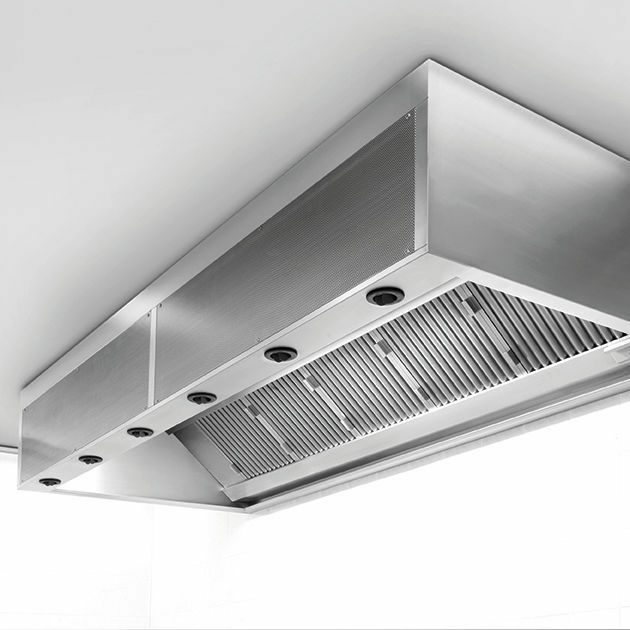 The canopy compensates for the extracted air by introducing the correct quantity of make-up / supply air to ensure the ventilation system of the kitchen is correctly balanced. The induction effect produced by this type of canopy enhances the capture and containment of the thermal plume from the cooking process and reduces the potential for the contaminated air to spill out into the kitchen area. This system also eliminates the potential of draughts in the kitchen. The COMPENSATOR-90 canopy is fabricated entirely in type 304 stainless steel (1.0 – 1.2mm) thick. All visible surfaces are ultra fine grain polished (320 grit) and polythene protected. The canopy is cut, punched and folded into seamless sections up to 6m in length and factory assembled by means of computer controlled seam welds and non visible mechanical fixings. Joints are provided with internal cover-plates so that no joints or mechanical fixings are visible. The canopy lower edge is formed into a condensation channel with inclined internal elevation to simplify cleaning and the inner edges are crush folded for safety purposes.